Hey, what else did George Lucas do to Star Wars this time? George Lucas’ quest to correct the mistakes of his past continues, with the upcoming Blu-ray editions bearing the computer-generated fruits of his labor and the true, final realization of his vision for Star Wars, depending on what time it is. And in addition to banishing puppet Yoda to the primitive age of the late ’90s, recipients of early review copies (as collected by io9 and confirmed by Badass Digest) say they have noticed that Lucas, as promised, has also made a few other minor tweaks here and there to the original trilogy. First up: Giving the Ewoks in Return Of The Jedi eyes that actually move and blink—a disconcerting addition at first, perhaps, but one that’s relatively benign, especially considering Lucas could have made them somersault and blow raspberries if he wanted them to, because they’re his and he can he do what he wants to them. Secondly, Obi-Wan Kenobi’s famed “Krayyt Dragon” call to scare off a band of Tusken Raiders in the original Star Wars has been enhanced, by which we mean it now sounds as though Obi-Wan accidentally sat on the pointy end of a walrus. Here’s the new audio synced with footage from an earlier, now-inferior DVD copy. And last and perhaps most controversially: In the climax of Return Of The Jedi, where Darth Vader at last regains his humanity after witnessing the torture of his son, turns on the Emperor, then throws him to his death in an act of ultimate defiance and self-sacrifice, the revelatory drama of this internal conflict is now more acutely expressed by Darth Vader yelling, “NOOOOOOOOOO!” a couple of times. 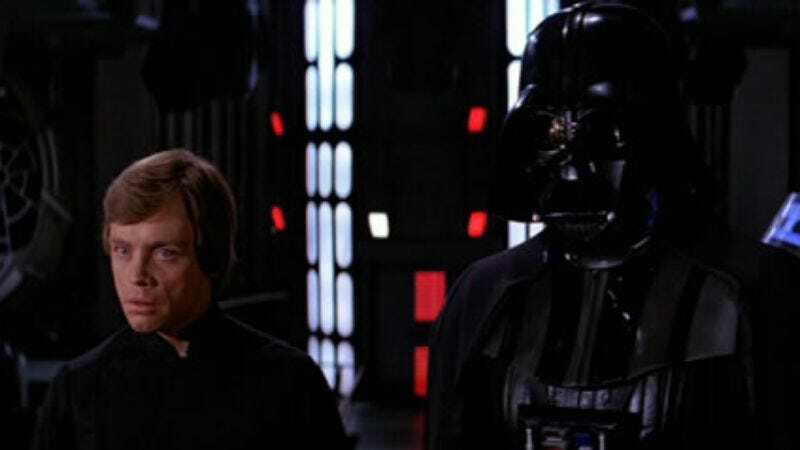 That line, a clear callback to Vader’s similarly expressive “NOOOOOOOOOO!” from Revenge Of The Sith, thus completes the character’s journey and reminds the audience that, while he seems superficially like the epitome of badass evil, Darth Vader is actually just the very sensitive victim of a life fraught with tragedy, torment, and difficult choices. Really, Lucas has only begun to scratch the surface when it comes to deepening our understanding of Darth Vader. Perhaps by the time of its next format release, there will be at least two or three more “NOOOOOOOOOO!”s to get that message across.